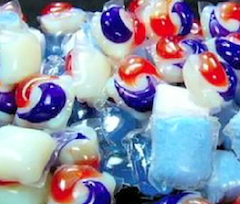 Here in the United States, land of free enterprise, we’re trying to solve the problem of children snarfing detergent pods by selling them in opaque containers and maybe making them look less like candy. In Scotland, authorities are taking a different tactic: distributing free cupboard latches to new parents and educating them about the dangers of delicious-looking detergent pods. One of the earliest medical journal writeups of the detergent pod issue came from the Royal Hospital for Sick Children in Glasgow, and the same institution reports an increase in the number of children brought in who are seriously ill after swallowing or biting into the pods. The local office of the National Health Service will target parents with babies too young to crawl yet with cupboard latches and information about keeping poisonous but delicious-looking items away from kids. The latches will come from home health visitors, the nurses that the NHS sends to visit babies and children to check on their health. The visitors will drop off 16,000 cabinet locks, and a public awareness campaign called “Not for play…keep them away” seeks to remind parents how delicious some washing tabs look to kids.